Sometimes it surprises me how the books popular in the blogosphere aren’t always the same ones as in the real world. I’ve only ever seen The Psychopath Test on one blog (Katie’s Book Blog – click here for her review) but when I went into the library the other day, they had seven shiny new copies on the New Release shelf. Not only that, but they were one-week-loan only, presumably because they’re just that in demand. I reserved my copy because I didn’t realise just how many would be in stock! What if society wasn’t fundamentally rational, but was motivated by insanity? This thought sets Jon Ronson on an utterly compelling adventure into the world of madness. Along the way, Jon meets psychopaths, those whose lives have been touched by madness and those whose job it is to diagnose it, including the influential psychologist who developed the Psychopath Test, from whom Jon learns the art of psychopath-spotting. A skill which seemingly reveals that madness could indeed be at the heart of everything . . . Combining Jon’s trademark humour, charm and investigative incision, The Psychopath Test is both entertaining and honest, unearthing dangerous truths and asking serious questions about how we define normality in a world where we are increasingly judged by our maddest edges. Everybody’s heard the term psychopath before, but how many of us actually know what it means? Therein lies the premise of Jon Ronson’s book – what is a psychopath and why do so many influential businessmen display the symptoms? Prompted by a mysterious package sent to many leading academics, Mr. Ronson eventually tracks down the man responsible and is intrigued by his odd mannerisms. This leads to a deep investigation of psychopathy and those who suffer from it – a mature, intriguing look at aspects of the mental health regulations worldwide. The actual Psychopath Test is a checklist devised by Bob Hare, used by medical institutions worldwide in an attempt to discover whether an individual is genuinely a psychopath. It includes symptoms such as pathological lying, lack of remorse and irresponsibility and is said to be the fool-proof method of detection. Jon Ronson meets with Mr. Hare to discuss various consequences of the existence of such a test. For example, the author frequently found himself quietly diagnosing his friends and relatives with psychopathy – like he was actually looking for reasons to deem them a psychopath. I can sympathise. I’ve spent the week since I read The Psychopath Test informing The Boy that he is, in fact, a psychopath. I’ve even blu-tacked a list entitled ‘Why Lewis is a Psychopath’ to the radiator and I update it periodically. When he gets annoyed, I tell him that it’s because he has a grandiose sense of self-worth – as befits a true psychopath. It can actually have more serious consequences than infuriating your loved one, however. The author meets with Toby, an inmate at Broadmoor who pretended to be a psychopath to avoid a prison sentence. Now, years after his sentence would have ended, the authorities refuse to release him because they still believe in his psychopathy despite his confession. Similarly, an experiment was conducted a few years ago where eight ‘normal’ people were told to complain that they heard a voice saying three words, but otherwise act completely normal. Each of those people was incarcerated and struggled to convince doctors of their sanity. Later, the head of the experiment told the mental hospitals that more individuals were about to carry out the same concept. A month later, the authorities proudly announced they’d caught forty imposters. How many had actually been sent in? None. 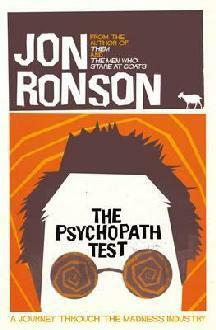 So obviously the Test isn’t infallible, and that’s what Jon Ronson sets out to investigate. On the way, he discusses the views of different organisations on the psychological profession, a number of conspiracy theories and speaks with a few successful business men suspected of psychopathy. It’s not always strictly on topic, but then at least it’s never repetetive. It has a very conversational tone – almost as if Mr. Ronson was sat across from you in a coffee shop, casually discussing psychopathy. As you do, obviously. He rambles sometimes and then suddenly realises and jumps back on track, but I like that. It never comes across as pretentious or preachy… Instead it’s informal and friendly. A quote on the cover proclaims how gloriously funny it is, but I didn’t really see it that way. I mean, I really enjoyed it and I loved Mr. Ronson’s ‘voice,’ but it’s not a funny book. But hey, I think that added to my enjoyment. I’d have respected The Psychopath Test a lot less if it trivialised psychopathy or tried to joke about the consequences. Long story short, I really enjoyed this book. It’s a very, very accessible piece of non-fiction, but without talking down to the audience. I’ll definitely be seeking out Jon Ronson’s other work- The Men Who Stare At Goats in particular. DUDE, I just clicked on this because it was like recommended to me on your Moranthology post, and I was like 'Ooh, I want to read that soon' (I have it in my TBR pile) and so I was like 'I should comment!' and LOOK! I already did! We had a bloke in the office once who was probably a psychopath…someone who actually left because of him sent round an article from the BBC about how to spot them in the workplace because they're not all killers, often people that walk all over others. Anyway, I'm interested in reading this one but I still have the one about men staring at goats to read that I bought before there were even plans for a film! This just prompted me to read the dictionary definition of psychopath and it seems my boyf is one too. Sounds really good though I love trying to understand what makes people tick. HA – "Why Lewis is a psychopath". Hilarious! That's exactly the kind of thing I would do to A and would drive him crazy. Also, I've gradually been coming to the conclusion that this world of blogging distorts trends a bit – I'd only seen Katie's review too (before yours, obviously…) and then when I was walking through Leeds train station the other day there was a huge sign advertising it! Funnily enough, it was that exact poster in Leeds station (somewhere near platform 2?) that prompted me to say that! I think it's because the blogging world tends to focus on YA for some reason, so adult non-fiction doesn't get a look in. I have the book version of The Men Who Stare At Goats but I didn't even realise it was the same author until I saw a review quote on the copy of this one. Might have to unearth it from my TBR. Lewis says the film is good though. It was – how weird! I feel bad sometimes for adult fiction in general being neglected so much. I think that yours and Ellie's blogs are really the only blogs that I follow that remind me that I shouldn't only be reading YA or fantasy books! I don't know, I think 'shouldn't' is a bit harsh. And everybody likes fantasy now and again – I wouldn't be half as into reading if it weren't for magic and dragons! Even YA too, although I'm in a kind of anti-teen book phase at the minute – got burned a few too many times lately, haha!